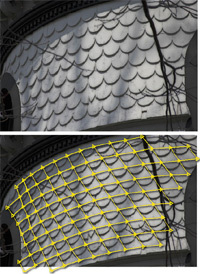 Understanding texture regularity in real images is a challenging computer vision task. We propose a higher-order feature matching algorithm to discover the lattices of near-regular textures in real images. The underlying lattice of a near-regular texture identifies all of the texels as well as the global topology among the texels. A key contribution of this paper is to formulate lattice-finding as a correspondence problem. The algorithm finds a plausible lattice by iteratively proposing texels and assigning neighbors between the texels. Our matching algorithm seeks assignments that maximize both pair-wise visual similarity and higher-order geometric consistency. We approximate the optimal assignment using a recently developed spectral method. We successfully discover the lattices of a diverse set of unsegmented, real-world textures with significant geometric warping and large appearance variation among texels. James H. Hays, Marius Leordeanu, Alexei A. Efros, Yanxi Liu (2006). Discovering Texture Regularity as a Higher-Order Correspondence Problem. 9th European Conference on Computer Vision.